Do you ever get in a breakfast rut? I do, often. In fact, it’s the meal at which I’m most likely to repeat the same foods over and over again. We’re talking months in a row of oatmeal. It gets old. 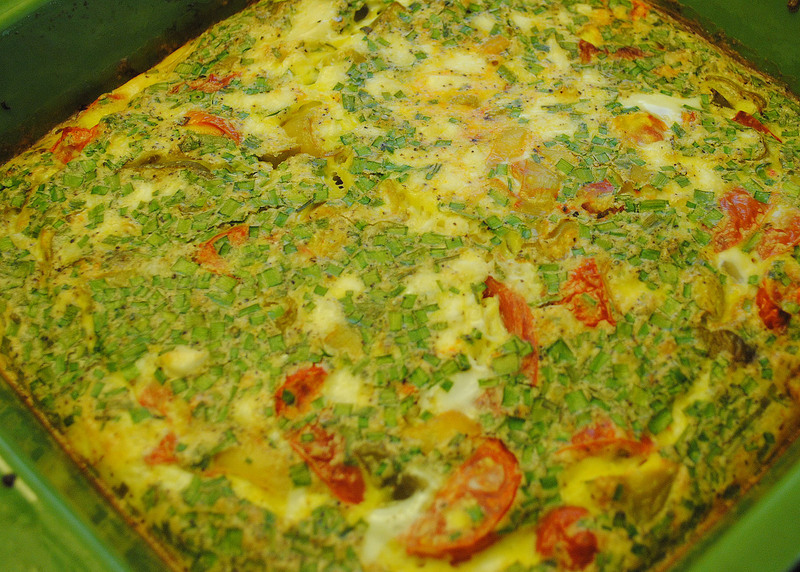 This casserole will add some variety to your breakfast routine. Roasted peppers and tomatoes combine with oregano and feta cheese for a combination of flavors not usually found on the breakfast table. Try this casserole on a weekend, as it takes a little while to prepare. It would be a great addition to a brunch spread. I made this one on a Sunday evening and reheated portions throughout the week. Preheat oven or toaster oven to 375 degrees. Spray a square baking dish with nonstick spray, or rub with olive oil. Place peppers into baking dish, sprinkle with oregano, and roast for 10 minutes. Break eggs into a bowl and beat until egg yolks and whites are well combined. Season eggs with lemon pepper and salt, and stir in chives. After peppers roast for 10 minutes, add tomatoes and stir to combine. Put dish back in oven and roast 15 minutes more, or until tomatoes start to look slightly shriveled. Sprinkle feta cheese over roasted peppers and tomatoes, then pour beaten eggs over. Return pan to oven and cook for 25-28 minutes, or until the top is lightly browned and eggs are set. (It will puff up a bit when it cooks, but after it cools for a few minutes the casserole will settle.) Serve hot. I really like the idea of using banana peppers in this. So glad you liked it! The banana peppers came in my CSA box, and they made a great substitution. That’s also the reason why I used whole tomatoes instead of cherry. Thanks for the recipe! This looks yummy. I’m definitely going to try this.